Aggramar’s Stride – Now has an additional 617 Critical Strike (@ ilvl 940) as a third bonus secondary stat. Now grants movement speed equal to 75% of your Haste, Critical Strike, Mastery, or Versatility, whichever is highest. Norgannon’s Foresight – Now triggers after standing still for 6 seconds (was 8 seconds), granting you the ability to cast while moving for 4 seconds (was 5 seconds). Now has a new visual indicating when you gain its ability to cast while moving. Now has an additional 617 Critical Strike (@ ilvl 940) as a third bonus secondary stat. Sephuz’s Secret – Now always grants 10% increased movement speed and 2% Haste. When triggered, this bonus is increased to the current values of 70% movement speed and 25% Haste. The 10% movement speed bonus now stacks with other movement speed bonuses. Roots of Shaladrassil – Now has an additional 658 Critical Strike (@ ilvl 940) as a third bonus secondary stat. Acherus Drapes – Now has an additional 771 Mastery (@ ilvl 940) as a third bonus secondary stat. Rattlegore Bone Legplates – Now also increases Bone Shield’s damage reduction by 2%. Service of Gorefiend – Now has an additional 1233 Leech (@ ilvl 940) as a bonus tertiary stat. Perseverance of the Ebon Martyr – Howling Blast deals 20% increased damage to enemies recently damaged by your Remorseless Winter (was 40%). Death March – Now also increases Death Strike and Death Coil damage by 10%. Tak’theritrix’s Shoulderpads – Damage bonus duration increased to 30 seconds (was 20 seconds). Achor, the Eternal Hunger – Now has an additional 658 Mastery (@ ilvl 940) as a third bonus secondary stat. Anger of the Half-Giants – Demon Blades generates an additional 1-6 Fury (was 1-8 Fury). Loramus Thalipedes’ Sacrifice – Damage bonus now starts with the first target hit (was second target hit). Mo’arg Bionic Stabilizers – Damage bonus now starts with the first target hit (was second target hit). The Defiler’s Lost Vambraces – Now has an additional 539 Avoidance (@ ilvl 940) as a bonus tertiary stat. Ekowraith, Creator of Worlds – Now has an additional 658 Haste (@ ilvl 940) as a third bonus secondary stat. Promise of Elune, the Moon Goddess – Now also increases the damage of Solar Wrath and Lunar Strike by 8%. Chatoyant Signet – Now also increases your Energy regeneration by 5%. Fiery Red Maimers – Now also causes your next Maim to cost no Energy. Oakheart’s Puny Quods – Barkskin instantly grants 45 Rage plus an additional 30 Rage (was 15 Rage) over 3 seconds. The Dark Titan’s Advice – Now also causes Lifebloom’s periodic healing to have a 5% chance to trigger the final healing effect. Tearstone of Elune – Allies healed by your Wild Growth have a 15% (was 20%) chance to also gain Rejuvenation. X’oni’s Caress – Now also reduces Ironbark’s cooldown by 20%. Essence of Infusion – Tranquility heals targets below 60% (was 50%) health for 60% (was 50%) more. Aman’Thul’s Wisdom – When your Rejuvenation heals a full health target, its duration is increased by 3 seconds, up to a maximum total increase of 15 seconds per cast. The Shadow Hunter’s Voodoo Mask – Now has an additional 658 Critical Strike (@ ilvl 940) as a third bonus secondary stat. Cord of Infinity – Each time Arcane Missiles hits an enemy, the damage of your next Mark of Aluneth is increased by 1%. This effect stacks. Darckli’s Dragonfire Diadem – Now has a new visual when Dragon’s Breath is cast. Pyrotex Ignition Cloth – Phoenix Flames reduces the remaining cooldown on Combustion by 9 seconds (was 6 seconds). Eye of Collidus the Warp-Watcher – Each time Soothing Mist heals, the absorb amount of your next Life Cocoon is increased by 3% (was 1%), stacking up to 50 times (was 100). Fixed a bug where the second Soothing Mist from Unison Spaulders did not grant a second stack of the buff. Ovyd’s Winter Wrap – Each time Enveloping Mist heals, its healing bonus has a 50% chance to spread to an injured ally within 30 yards. Ei’thas, Lunar Glides of Eramas – Uplifting Trance increases your Vivify healing by an additional 10% and causes it to heal 1 additional target. Drinking Horn Cover – The duration of Storm, Earth, and Fire is increased by 0.4 seconds (was 0.6 seconds) for every Chi you spend. The duration of Serenity is now extended by 0.3 seconds every time you cast a Chi spender. The Emperor’s Capacitor – Damage bonus per stack increased to 100% (was 50%). Hidden Master’s Forbidden Touch – Now also increases Touch of Death’s damage by 40%. Katsuo’s Eclipse – Reduce the cost of Fists of Fury by 1 Chi (was 2 Chi). March of the Legion – Now has an additional 1068 Mastery (@ ilvl 940) as a third bonus secondary stat. Haste stat reduced slightly. Uther’s Guard – Now has an additional 617 Haste (@ ilvl 940) as a third bonus secondary stat. Ilterendi, Crown Jewel of Silvermoon – Judgment increases all healing you do by 15% for 5 seconds (was 20%). Tyr’s Hand of Faith – Reduces the cooldown of Lay on Hands by 70% (was 60%). Tyelca, Ferren Marcus’s Stature – Now also increases Avenger’s Shield’s damage by 20%. Aegisjalmur, the Armguards of Awe – Now has an additional 617 Haste (@ ilvl 940) as a third bonus secondary stat. Justice Gaze – Now also causes Hammer of Justice to generate 1 Holy Power when used against targets above 75% health. Mastery reduced by 412 (@ ilvl 940) and Haste increased by 412. Skjoldr, Sanctuary of Ivagont – Now also increases Power Word: Shield’s absorb amount by 15%. Muze’s Unwavering Will – Now also affects Flash Heal. Rammal’s Ulterior Motive – Healing bonus increased to 20% (was 15%). Zenk’aram, Iridi’s Anadem – Now also increases Voidform’s Shadow damage dealt bonus by 3%. Anund’s Seared Shackles – Each time Shadow Word: Pain and Vampiric Touch deal damage, your next Void Bolt gains 3% (was 4%) increased damage, stacking up to 50 times. Mantle of the Master Assassin – Fixed a bug where Subterfuge combined with Vanish granted an additional 3 seconds of benefit. Will of Valeera – Now has an additional 658 Mastery (@ ilvl 940) as a third bonus secondary stat. Haste reduced by 412 and Critical Strike increased by 412. Akainu’s Absolute Justice – Lava Lash deals 50% (was 30%) increased damage while your weapons are enhanced by both Flametongue and Frostbrand. 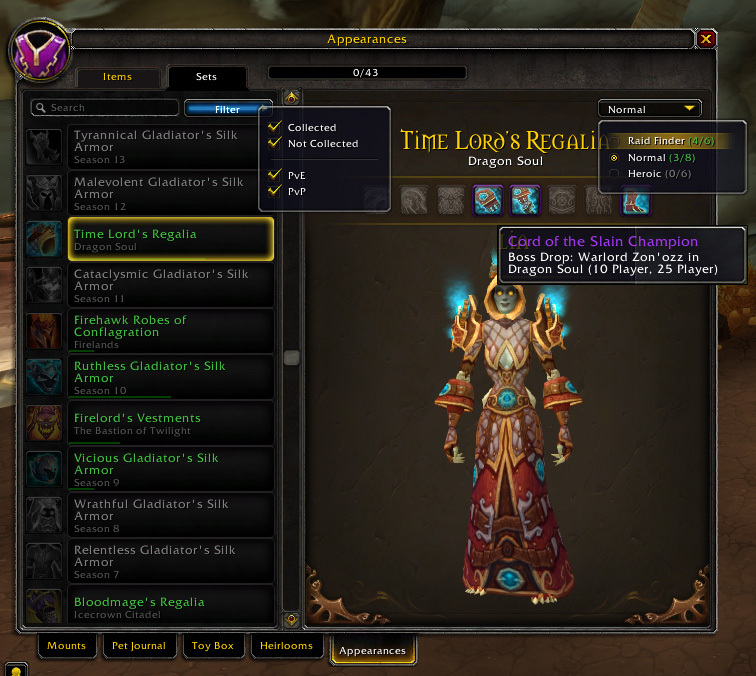 Spiritual Journey – Now has an additional 617 Haste (@ ilvl 940) as a third bonus secondary stat. Nobundo’s Redemption – Chain Heal reduces the cost of your next Healing Surge by 50% (was 30%). Pillars of the Dark Portal – Now has an additional 658 Haste (@ ilvl 940) as a third bonus secondary stat. Sacrolash’s Dark Strike – Now also increases Corruption’s damage by 15%. Sin’dorei Spite – With Grimoire of Supremacy, there is now a visual debuff that displays the 3-minute cooldown. Timeless Stratagem – Now has an additional 717 Versatility (@ ilvl 940) as a third bonus secondary stat. Mannoroth’s Bloodletting Manacles – Now has an additional 771 Versatility (@ ilvl 940) as a third bonus secondary stat. The Walls Fell – Now also increases Shield Slam’s Rage generation by 2. Thundergod’s Vigor – Each enemy you hit with Thunder Clap reduces the remaining cooldown on Demoralizing Shout by 3 seconds (was 1 second).